According to the World Health Organization, CVD is responsible for the most deaths worldwide with more people dying from cardiovascular related conditions than any other cause. Hypertension (high blood pressure) and coronary heart disease (disease of the vessels supplying blood to the heart) are the most common diseases of the cardiovascular system, and cases of both hypertension and coronary heart disease are rising rapidly in Fiji, due to the change in lifestyle in recent decades. Other diseases of the cardiovascular system include rheumatic heart disease, caused by damage to the heart muscle and valves by rheumatic fever from streptococcal bacteria, congenital heart disease which are malformations existing at birth, cerebrovascular disease which is the disease of vessels supplying blood to the brain, responsible for stroke and peripheral arterial disease which is the disease of the arteries in the arms and legs. How is lifestyle related to CVD? Around 80% of cases of coronary heart disease are related to lifestyle factors including smoking, excessive alcohol intake, inadequate physical activity and an unhealthy diet that is high in processed and nutrient poor foods. Having an unhealthy diet and inadequate exercise may show up in the body as being overweight or obesity, hypertension or raised blood sugars – these are all risk factors for developing CVD. How does my nutrition affect my heart? Eating a balanced diet that includes a variety of different, healthy foods and plenty of fruits and vegetables is one of the most important things you can do to keep your heart healthy and reduce your risk of CVD. Here is the latest information in nutrition and heart health. Fruits and vegetables are packed full of vitamins, minerals and antioxidants, which are essential for our body to function optimally. When our body does not get these nutrients, it is difficult for our body to be healthy and we are more susceptible to disease and illness. They have fibre, which not only keeps us regular, but fibre also helps to slow down digestion in our bowel, keeping us fuller and also helping to reduce cholesterol. Cholesterol is essential for our health, it is important for the structure of our cell walls and making hormones. However too much of the wrong kind of cholesterol can be bad for our health and increase our risk of CVD. Cholesterol in our diet only makes up a small amount of cholesterol in our blood, as our body makes its own cholesterol – it is mainly saturated fat in our diet that increases our blood cholesterol. There are different types of cholesterol, HDL Cholesterol (Good) and LDL Cholesterol (Bad). Chicken skin, visible fat on meat, all fried foods, fried fish, cakes, pastries, biscuits, white bread, processed meats such as sausages and deli meats. High salt intake contributes to high blood pressure or hypertension and puts you at risk of CVD. Too much salt increases the pressure of our blood, which can damage our blood vessels, putting us at risk of stroke and other CVD. Salt is in most foods we eat, but high amounts are found in processed foods and processed meats, even if they don’t taste salty! High salt foods include – all take away foods, stir-fry noodles, curries etc. Noodles, bread, butter, breakfast crackers, chips, bongos, sausages, pizza, bottled sauces, tinned fish and deli meats. We can get enough salt naturally from the fresh foods we eat and there is no need to add salt to our meals that we cook at home. It is difficult to control the amount of salt you consume when eating out, as there is often a lot of salt added in cooking as a flavor enhancer. The more salt we use, the more our taste buds get use to it, so reducing salt can initially result in food tasting very bland, but taste buds will get used to the new tastes in just a couple of weeks and you will be able to taste the natural flavour of foods again! The best way to reduce your salt intake is to eat only fresh foods, avoiding processed foods where possible, and make use of herbs and spices for flavour – dhania, mint, basil, chili and other spices – these are cheap and add heaps of flavor! Meat can be very healthy for us as it contains many vitamins and minerals such as Iron, Vitamin B12 and Zinc, but it can also contain high amounts of saturated fats that increase our cholesterol – we should keep our serves of meat to the size of the palm of our hand, and the thickness of the palm of our hand. The best meat to eat is lean meat, the meat that has low amounts of fat, these are – chicken without the skin, red meat without visible fat and freshfish and shellfish. BBQ meat is generally very fatty. Avoid processed meats such as sausages, salami and other deli meats as these are high is saturated fat and salt. Fish is very low in saturated fat and contains Omega 3’s a healthier type of fat that helps to protect our heart, increase good cholesterol and decrease bad cholesterol. Salmon, tinned salmon, tinned and fresh tuna and sardines have the high amount of omega 3’s. Fresh fish is better as tinned fish often has a lot of salt added to it, but if you choose a low salt variety (less than 450mg per 100g) this may also be a good option. Avoid seafood that has been fried or battered as this will be high in saturated fat and increase your risk of CVD, despite the health benefits of the seafood. Aim for 2-3 servings of fish each week. Food and Nutrition in Fiji, A Historical Review – Volume 2, Nutrition Related Diseases and their prevention, Chapter 20 – Cardiovascular diseases, 1991. What are vitamins and what do they do for our body? Vitamins are very small compounds that our body uses for every function such as using food for energy, growth and development of our body and proper immune function. Some vitamins are classified as fat-soluble which means they can be stored in our body for later use, some are water soluble which means they can not be stored in our body and we need to have these on a daily basis for optimum health. Vitamin A is an important vitamin for our eyesight, keeping our immune system working well and is also important for healthy reproduction and the development of the fetus. Vitamin A deficiency is common in Fiji due to the limited access to foods high in this vitamin, and health problems are mostly seen in times of high nutritional need – infancy, childhood, pregnancy and breastfeeding. Vitamin A deficiency can lead to increased severity of infections and childhood blindness. Those that are deficient in Vitamin A are often deficient in Iron, putting them at risk of anemia. What foods can I use to get more Vitamin A every day? Green leafy vegetables such as watercress, bele, spinach and chinese cabbage. Zinc is an essential vitamin for proper immune function, wound healing, energy production, mental functioning and DNA synthesis. Zinc deficiency is difficult to test for, but some people are at higher risk than others. Having a diet that is high in nutrient poor, processed foods that are not fortified with zinc and a diet high in foods grown in zinc deficient soil may place you at risk of deficiency. Zinc losses may also occur if you have diarrhoea for an extended period of time. What foods can I use to get more of these vitamins every day? Oysters, shellfish, red meat and poultry are great sources of Zinc, as well as nuts (cashews and almonds), milk and whole grain foods. Baked beans, tofu and chickpeas also contain zinc and are good alternatives to meat. Soak some dried beans or chickpeas and add these into curries, stews, salads and sandwiches (or anything else you like!) for an extra boost of zinc. Iodine is used by our bodies to produce thyroid hormones whose job it is to regulate our metabolism – how quickly or slowly our body processes the food and drinks we consume. It is essential that we have Iodine in our diet, as our body is unable to make it. Our requirement for Iodine increases during pregnancy and Iodine deficiency during pregnancy is the leading cause of mental retardation and intellectual disability in infants and children. As Iodine is responsible for the proper functioning of the thyroid gland, all symptoms of Iodine deficiency are related to thyroid function. Some of the symptoms are: Goiter (enlargement of the thyroid gland in the neck), which can lead to breathing difficulties and choking. Seafood is one of best sources of Iodine, and having 2-3 serves per week will contribute to your iodine intake. Seaweed, dairy products, eggs are also a source of iodine. Although it is not recommended to add salt into your cooking and onto meals, if you do use salt, make sure it is iodised salt. Vegetables can also be a good source of iodine if grown in soil that contains iodine. Do I need an Iodine supplement? It is best to discuss with your health professional if you could benefit from an Iodine supplement, as there are some cases where too much Iodine from supplements can be harmful to your health. A healthy, balanced diet should give you all your Iodine needs, however, as our needs increase in pregnancy and breastfeeding, if you fall into one of these categories and you also find it difficult to eat a good variety of whole foods, you may need an Iodine supplement. Iron is responsible for the transport of oxygen throughout our blood and is responsible for keeping our immune system strong and giving us energy throughout the day. Not enough iron can lead to fatigue and increase our susceptibility to illness, however too much iron can lead to iron toxicity. It is important to see a doctor if you think you may be iron deficient, as taking a supplement without a diagnosis can be harmful to your health. In Fiji, Iron deficiency is a big problem with 50% of children under 5 and 40% of women being iron deficient. Iron comes from both animal sources (haem iron) and plant sources (non-haem iron), haem iron is more easily absorbed by our body. If your iron intake is from plant sources only, then you may need much more iron as it is not as well absorbed. Am I at risk of iron deficiency? Vegetarians or vegans, who have poorly managed diets without meat substitutes. People who have experienced heavy blood loss through injury or menstruation or who regularly give blood. Pregnant or lactating women who have an increased need. Adolescents experiencing a growth spurt where there is an increased need for iron, among other vitamins and minerals. Athletes also have a higher requirement for iron. How can I ensure I am getting enough iron? 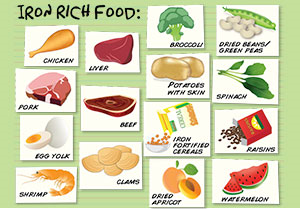 Include iron rich foods such as red meat, poultry and fish. Plant sources of iron include dark green leafy vegetables, nuts and seeds, dried beans and peas and iron fortified bread and cereal products. Combine foods that are high in vitamin C, such as fruit, citrus and tomatoes, with foods high in iron as it increases the absorption of the iron. Avoid drinking tea around the time of consuming iron containing foods as tea can block the absorption of iron. You should first discuss your need for vitamin supplements with a qualified health professional as more is not always best and too much may cause harm, especially Vitamin A and Iron. See our sections on Iron Deficiency and Micronutrient Deficiency on this website.